This past Saturday a dedicated bunch of friends and family ran a half marathon in Evie's honor (21.08 kilometers for my international friends ;). It really was a lovely experience and I think everyone ran better than they expected, myself included. I was able to run over 7 miles without stopping. Somewhere between miles 7 and 8 I decided walking was necessary and ran off and on until the last mile, which I ran/jogged/hobbled. I wanted to share some things I learned along the way and some pictures. I hope you enjoy. 1. The first few miles will go by quickly. The others ... not so much. 2. Drinking water from a small paper cup is almost impossible without getting half of it on your shirt. 3. 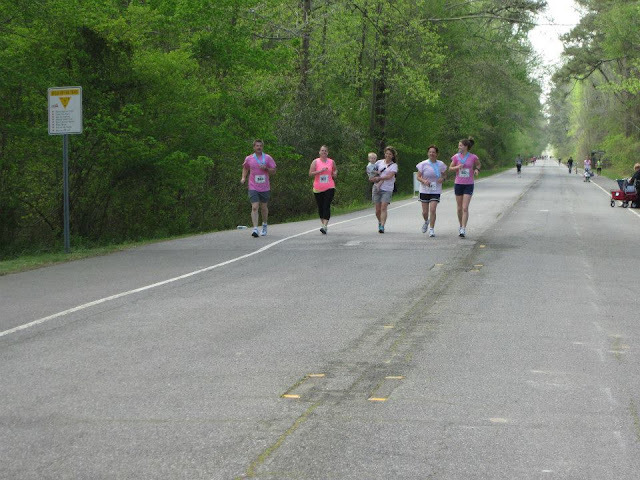 People of all shapes, sizes, and ages will be faster or slower than you. And it changes about fifty times along the way. 4. I saw a turtle along the path. I think he was moving faster than I was. My sister, mom, and dad came back to run me in (they finished wayyyy before I did). 5. Some people were brave enough to ask about Evie. It meant so much. And I have a sneaking suspicion these people have felt the pain of losing a loved one as well. 6. You can breathe through tears. 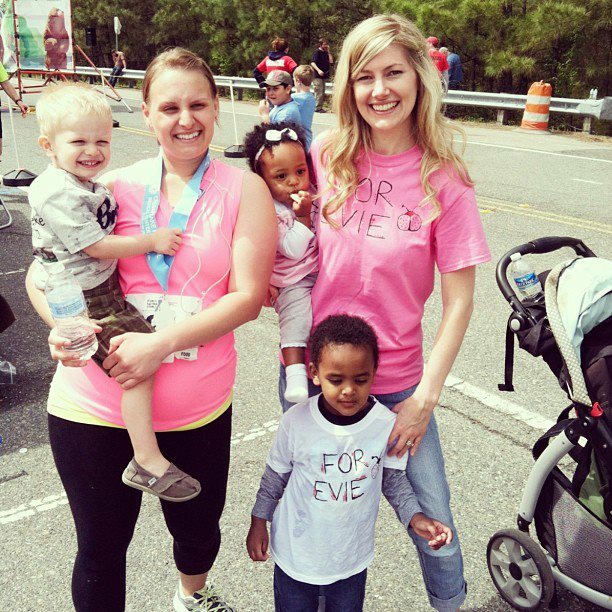 Evie shirts - "Running in honor of: Evie Caris Rieke, November 8, 2012, Fearfully and wonderfully made. 9. At the end of the race you will feel like jello. 10. Once again, little girls in Heaven motivate you to do things you never thought you had the strength to do. Thank you so much to all the participants, fans, and prayer warriors who supported me on Saturday. Thank you for honoring my sweet girl. I don't know if you noticed, but I cried as you were running to the finish line. I am so proud of you and so blessed to be your friend. We all love you and Evie so much!!! Ok, so I'm super emotional but this definitely made me cry! I'm so happy you got to do this! And what a blessing to have so many people that love you and Evie.